By nightfall, my BFF and I were still feeling somewhat full due to the heavy lunch at Bistro Remedios. Nevertheless, not wanting to miss the opportunity to savour more Filipino cuisine on our second and last night in the capital city, we decided to give Manam at SM Mall of Asia a try. All of the food items in Manam are served in three different sizes: small, medium and large. We decided to share four small-sized dishes. 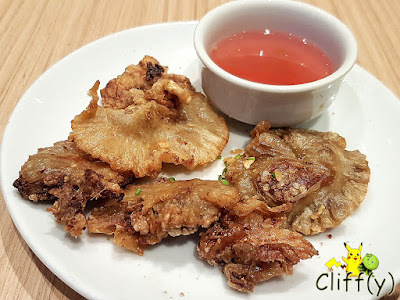 A popular Filipino appetiser of all times, Chicharon Bulaklak is a dish of deep-fried pig intestines. Served with pink-coloured vinegar concoction at Manam, each of the pieces was enjoyably crispy, but it could be less oily. 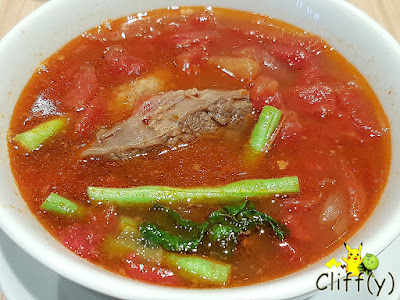 Did you know that sinigang is related to a Malay dish called singgang? Anyway, I found the tamarind-based soup to be refreshing, thanks to its sour and savoury taste. Coloured red due to tomatoes and watermelons, the soup had tender beef short ribs and crunchy long beans. Don't worry, it's not spicy at all. From my (limited) experience thus far, Filipino's interpretation of congee is usually quite flavourful. Manam's version that evening was nothing short of that. 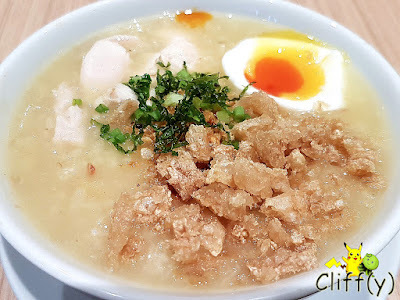 The chicken congee wasn't only heart-warming, but also pretty substantial with poached egg and deep-fried pork rinds. 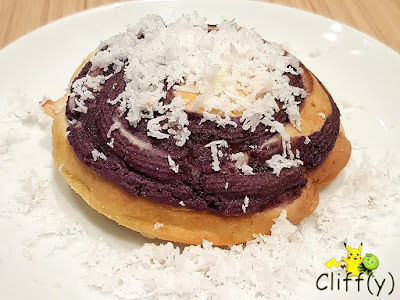 That was my virgin experience with bibingka, a type of cake typically made of rice flour and coconut milk as the two main ingredients. Added with yam that lent an earthy aroma, the cake was pretty soft and spongy. What came as a surprise was the inclusion of salted egg in the dough that balanced out the overall mild sweetness. 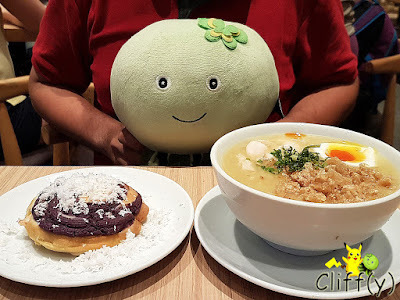 Pika's advice: You may want to consider the restaurant's assortment of fusion dishes, such as Sinigang Salmon Head with Miso and Pritong Hito with Pork Floss, which I didn't try. 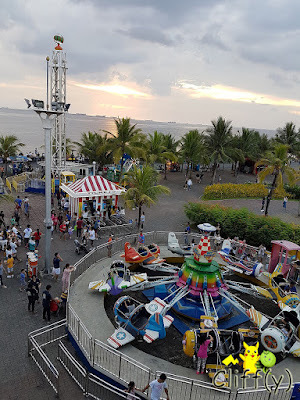 Just curious, has anyone partaken in some fun at SM by the Bay?